By Father Ziad Hilal, S.J. ALEPPO, Syria–For the past few days, Aleppo city has been breathing sighs of relief. Since the rebels reached an agreement with the regime forces and its allies to evacuate all civilians and militants from their last stronghold in east Aleppo city, there finally can be some peace. From the very start of the Syrian civil war, Aleppo has paid the greatest price on the humanitarian, social, economic and environmental level. Many people had to evacuate their houses and shops due to violence. So many lives were lost, leaving countless numbers of widows and orphans. Trees and park benches are chopped by those desperate for heating, given the scarcity of fuel and gas and exorbitant prices. Once a city of five million inhabitants, only 1.5 million people remain. This particularly cold winter many families are left homeless, finding shelter in the streets, in abandoned factories and construction sites. Humanitarian agencies are not managing to coordinate their activities, which has resulted in chaos. Most of the evacuated children have not been able to go to school for the last three years, which spells disaster for the next generation of adults. Disease is spreading freely among women and children, many of them left without a father who has been evacuated from eastern Aleppo. No Christian here ever thought of leaving Aleppo were it not for the hell in which people have been living. The humanitarian conditions are horrific. The city has been without electricity for the past six months! Even when the power lines are operating normally, only one or two hours of service at best is provided. Water is cut off routinely and many parts of Aleppo have been without water for 40 days. The old historic churches in the old city area are destroyed beyond repair. Aleppo was home to 120,000 Christians before the war; now only 30,000 remain. The war, the violence, the horrible humanitarian conditions, and the fear for their lives and the lives of their children forced families to take the tough decision to flee to Lebanon or beyond. Clergy and men and women religious who have remained are continuing their ministry to those who are still here. Jesuit Relief Services here serves 10,000 hot meals every day to people of all faiths and backgrounds; we also hand-out baskets each day with both food and non-food items. We also provide medical and social services. All the Churches in the city work in harmony to help Christians and Muslims alike. My reflections will touch upon something few in the West realize: Christians in Aleppo have always played a major part in mediation between warring factions. They need to continue to play that vital role, especially now, when the country has taken a step toward a new chapter of peace and reconstruction. Syrian Christians will follow the lead of Pope Francis, who insists that that there is a three-part solution to the Syrian crisis: forgiveness, dialogue, and reconciliation. Bringing that about is the calling of every Christian in Syria today. 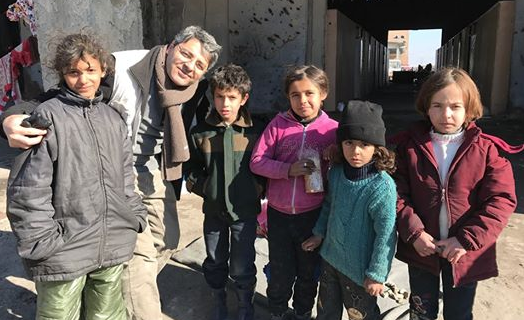 Father Hilal is the representative in Syria for the international Catholic charity Aid to the Church in Need (ACN).